Powers/Abilities: Like all Homo mermani, Naga possessed roughly ten times human strength, putting him in the enhanced human range, at least during his younger years. He could swim at about 35 mph and had enhanced human durability. He required water to breathe (via gills), and would suffocate in about five minutes out of water. He could see acutely in virtual darkness, resist near freezing temperatures, and was otherwise adapted for life at the ocean depths. 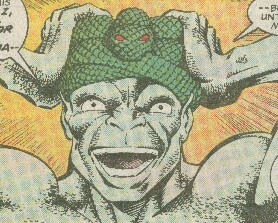 Via the Serpent Crown, Naga drew great mystical power from the Serpent God Set, granting him Class 10 strength and the ability to project concussive energy powerful enough to lay waste to entire cities, fly, read minds, create illusions, teleport himself or others, and control the minds of others, among many other feats. It also prevented him from aging, though it could not restore his youth once he had aged. (Official Handbook of the Marvel Universe Update'89#5) - The man who would become Naga is a member of the water-breathing, blue-skinned species of humanity known as Homo mermanus, specifically the portion of this race that went to live on the sunken Pacific continent of Lemuria. (Sub-Mariner I#10 (fb)) - Lemuria came to be ruled by one man, one who, behind gates forever guarded, took Naga for his name...and the seven-headed serpent for his symbol. <Approximately 600 years ago> - As Naga worshipped the Elder God Set, the Serpent God in turn marked Naga with scaly, serpentine skin to match Set's own. Set instructed Naga to take the ancient Serpent Crown from the remains of the skeletons of Phraug and Atra, where it had lain for over 17, 000 years, shunned by all. Naga sent one of his citizens to retrieve the Serpent Crown for him, and the terrified man removed it from their hands, but immediately fell dead. Though his aides were cowed by this omen, Naga claimed the Crown himself, stating that it was merely a sign that no unworthy man could lay his hands on the sacred crown of almighty Set. Embracing the Crown's power, Naga felt that he was like unto a god himself, and he began a reign of terror matched by few other despots in all of Earth's history. (Official Handbook of the Marvel Universe Update'89#5) - Set was so pleased with Naga that he instructed Naga in the way to treat the Serpent Crown with certain oils from fish that would enable the Crown to preserve his youth for as long as he wore it. (Sub-Mariner I#10 (fb) - BTS) - Naga dispatched his servants to find the above fish-creature, long thought extinct. (Sub-Mariner I#10 (fb)) - Ontarr and other servants of Naga located one such fish-creature, captured it with mind-numbing drugs, and brought it to the royal palace. The Alchemists of Lemuria, who took credit for discovering the life-giving powers of the fish-creature, immersed the Serpent Crown in the creature's vital fluids. The Alchemists then gave the treated Crown to Naga, who rewarded them by mentally forcing them all to commit suicide so that only he could know the secret of the Crown. 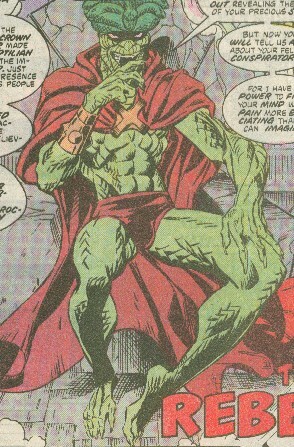 (Official Handbook of the Marvel Universe Update'89#5 / Sub-Mariner I#10 (fb) / Daredevil Annual#4B/6) - Wearing the Crown made Naga even more reptilian in appearance: his skin grew more scaly, his outer ears vanished, and his skull grew more serpent-like in shape. The mystical influence of the Crown mutated the Lemurians as well, turning their skin scaly as well (see comments). (Official Handbook of the Marvel Universe Update'89#5 / Daredevil Annual#4B/6) - Naga lived for centuries in the prime of his health and vitality, and generation after generation of long-lived Lemurians writhed beneath his relentless heel. Naga presided over one of the most oppressive and sadistic despotisms in the history of Earth, characterized by continual murder, torture, and imprisonment of those subjects whom he chose to regard as an enemy or law breaker. Through the power of the Serpent Crown, Naga crushed most rebellions with ease. (Official Handbook of the Marvel Universe Update'89#5 / Daredevil Annual#4B/6 / Sub-Mariner I#10 (fb)) - A group of young dissidents who had developed telepathic powers--later known as the Ancients--proved able to use their powers to hide themselves from Naga's detection, though they knew they held no hope of overthrowing his regime. Instead, they planned to flee Lemuria altogether. They had put their plan into immediate operation when Naga captured one of their number, Aurwel. The rebel cursed Naga and refused to give in to his interrogation. Naga tried to tear the information from Aurwel's mind, but found that his telepathy shielded his thoughts. The enraged Naga blasted Aurwel's head off with his power. (Official Handbook of the Marvel Universe Update'89#5 / Sub-Mariner I#10 (fb) / Daredevil Annual#4B/6) - The other rebels, including Bekkit, Jhandark, and Pyscatos debated whether to steal the Crown or attempt to slay Naga. Ultimately they decided that their numbers were too few to stand against Naga's army. Pyscatos personally slipped into Naga's chamber in the middle of the night, stealing the Crown and escaping with the Crown alongside his allies. Their presence shielded by their telepathy, the thieves fled southward to Antarctica, while the rebels used their own self-hypnosis to protect themselves from the Crown's demonic influence. (Sub-Mariner I#10 (fb) / Daredevil Annual#4B/6 - BTS) - Bekkit encased the Crown in an unidentified substance to protect them from Set's influence. (Official Handbook of the Marvel Universe Update'89#5 / Sub-Mariner I#12 (fb) / ) - Deprived of the Crown, Naga began to age, slowly but inexorably. He formed a cadre of warriors known as the Questors to seek out the Crown, Karthon was chosen as foremost among Naga's Questers, but they went for many decades without success. (Sub-Mariner I#10 (fb) / Daredevil Annual#4B/6 - BTS) <19th century> - Pyscatos eventually succumbed to the encased Crown, became a follower of Set, and slew the other Ancients before realizing what he had done, after which he slew himself and destroyed the city of the Ancients. (Official Handbook of the Marvel Universe Update'89#5 / New Mutants Annual#5/3) - In recent years, Llyra, half-Lemurian mutant, came to live in Lemuria, where she rose to the position of high priestess of Set. She ingratiated herself with the now quite elderly Naga and gained his support both through sexual favors and through their mutual worship of Set. Even in his prime Naga had been partly insane, and his madness had increased over the years. Secretly Llyra sought to manipulate Naga in order to gain power herself. She was rewarded when Naga proclaimed that she was to marry his oldest living heir, Prince Merro (Llyra herself disposed of the woman Merro truly loved, Namora, by murdering her). (Sub-Mariner I#9 - BTS) - Finally, in the modern era, Namor the Sub-Mariner recovered the encased Crown, then known as the Helmet of Power, which he transported to Atlantis. There the casing crumbled, exposing the Serpent Crown; Naga then either tapped into the Crown's power and assaulted the Atlanteans, or Set himself reached out using Naga's name. 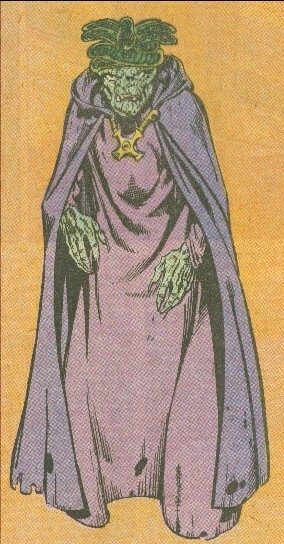 Dorma, acting as the Priestess of Naga, donned the Crown, which put the entire city of Atlantis under its control. When Namor returned the city, his former subjects attempted to slay him until he managed to tear the Crown from her head. 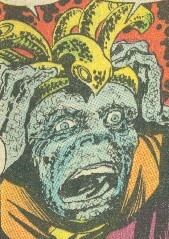 Resisting the Crown's power, Namor cast the Crown into a chasm, where it was found by Karthon. (Official Handbook of the Marvel Universe Update'89#5 / New Mutants Annual#5/3 / Sub-Mariner I#10+11 - BTS, 12) - Karthon succeeded in recovering the Serpent Crown from Namor, and brought both the Crown and Namor to Naga in Lemuria. Llyra and Naga monitored Karthon's progress, with Naga calling to Karthon telepathically as he approached. Llyra "comforted" Naga as they watched. Naga told her that when he had the Crown again, he would reward her by making her the bride of Naga. (Sub-Mariner I#12 / New Mutants Annual#5/3) - Upon reaching Lemuria, Karthon returned the Serpent Crown to Naga, who puzzled all by his inaccurate claims to have regained his youthful vigor from the Crown, though he did regain his full power. When Namor decried Naga, the Lemurian king ordered his death, and when Karthon refused to murder the unarmed Namor, Naga struck him down with the Crown and sent the other Questers to attack Namor. Namor collapsed the royal chamber over Naga's throne, at which point Naga cast an illusion that made it appear Dorma had appeared in the throne and was crushed by the falling debris. (Sub-Mariner I#13) - Karthon tried in vain to hold back the vengeful Namor, who tossed both he and the other Questers aside, only to be blasted away by Naga himself. Karthon asked Naga, in the name of the loyal and faithful Questers, to stay his hand against Namor, and Naga responded by using the Serpent Crown to obliterate the other Questers. Devastated, Karthon asked Naga to slay him as well, but Naga refused, wishing to keep Karthon as his enforcer. Naga summoned the Weapons-Men from the Abyss against Namor, and when they failed, Naga summoned the monstrous Gargantos, who was blinded in battle with Namor and preceded to virtually demolish the city of Lemuria. Namor then challenged Naga himself, but when the king had stunned him with a powerful blast, he showed Namor that the woman he had thought was Dorma was actually a Lemurian woman, Llyna, Karthon's sister. Enraged by this final betrayal, Karthon grabbed his sword and slew Naga from behind before he could kill Namor. Karthon was nearly overcome by the evil call of the Serpent Crown, but Namor helped him resist it, and he placed the Crown on Naga's corpse, which was then pulled into a great fissure which opened in the ocean floor. (Fantastic Four Annual#22 (fb) - BTS) - Naga lay dead and buried with the Serpent Crown on his brow for years, causing it to permanently bind to his spirit. 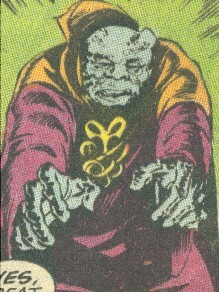 (Marvel Two-In-One#66 - BTS) - Hugh Jones, wearing a pair of Serpent Crowns (including one from Earth-S), formed the first Congress of the Crowns, summoning ethereal manifestations (or perhaps psychic reflections) of everyone who had ever worn one of the two Serpent Crowns (...or the Cobra Crown). 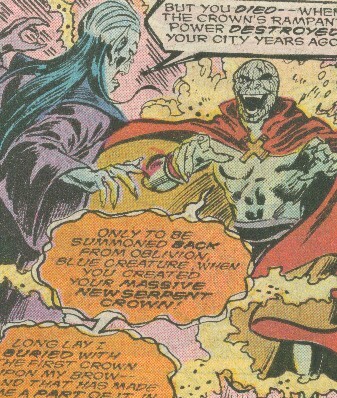 Naga was amongst these manifestations, which Jones sent to attack the Scarlet Witch, Stingray, and the Thing. All of the manifestations vanished when the Thing tore the Crowns from Jones' head. (Silver Surfer Annual#2 - BTS) - When Ghaur and Llyra created a new, giant Serpent Crown, Naga's spirit was summoned back from oblivion. (Fantastic Four Annual#22) - When Ghaur attempted to tap into the full power of the new Serpent Crown, Naga's spirit was released, and it fought Ghaur for mastery of the Crown. The two annihilated each other. Comments: Created by Roy Thomas, Marie Severin, and Dan Adkins. 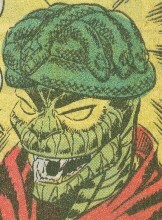 Naga has entries in the Official Handbook of the Marvel Universe Update'89#5, as well as the Master Edition. It is shown in Sub-Mariner I#10 that Naga is not his original name; he likely took the name from the ancient Hindu Serpent Gods. Check the net under "Naga serpent Hindu) and you'll find out more. Most reports depict Naga as green in color, and many depict all Lemurians as green as well, though the original pictures in Sub-Mariner I had him as blue-skinned, and the OHotMU Update '89 entry states that Naga and the other Lemurians retained their blue skin). I don't recall myself, though I'd think the other Lemurians to be blue, and Naga to have turned green under the Crown's influence, but returned to blue after being deprived of it for many years. My notes say he first became emperor of Lemuria around 2500 BC. Any idea where that came from?